comScore released the results of its study about online video rankings within the United States for January 2011. comScore, which performs digital business analytics, found that 171 million users in the U.S. watched online video content last month. According to data from the comScore Video Metrix service, 83.5% of the U.S. Internet audience viewed online video. Google’s myriad of sites, which includes YouTube, tops the list with 144.4 million unique viewers for January. The rest of the “Top U.S. Online Video Properties by Video Content Views Ranked by Unique Video Viewers” is, in order, VEVO, Yahoo! sites, Viacom Digital, AOL, Facebook, Microsoft sites, Turner Digital, Fox Interactive Media, and Hulu. Curiously, Netflix dose not appear in comScore’s top 10 list. Data from other sources indicate different results, however. Nat Worden, who reports on business and financial news for the Wall Street Journal, writes, “Netflix has become the only paid video service to be a top-10 video site on the Web in terms of total number of streams and unique visitors.” Worden also reports on general viewership, citing a Nielsen study that found a 45% growth in time spent watching online video when comparing January 2011 to the same time last year, as well as 28% increase in quantity of video streamed. The number of viewers only increased 3.1%. DVD rental company Redbox will soon launch an online streaming service to compete with Netflix, as reported on the Los Angeles Times‘ Company Town blog. For a monthly subscription fee, Redbox customers would be able to watch digital content on multiple devices in addition to renting physical discs from kiosks. Still, sites with free online content — such as Hulu (not Hulu Plus) — continue to dominate. In Advertising Age, digital media reporter Laura Rich describes Hulu as a “clear leader” in online video advertising and adds that the site may be one of the factors leading to increased pricing. The aforementioned comScore study found that Hulu had generated the highest number of video ad impressions in January, with more than 1.1 billion. Marketers spent $1.5 billion in 2010 (an increase of 48.1% over 2009), as estimated by eMarketer. Nearly one-third of all online ad dollars is expected to go to video in 2011. Analysts expect by 2014 that the online video market will be $5.71 billion at the high end of the estimate spectrum (eMarketer), and at the very least, $3.01 billion (Forrester Research). Through a collaborative effort, Bright Cove and Tube Mogul are releasing quarterly reports with online video statistics. The “Q4 2010 Online Video & the Media Industry Quarterly Research” report (PDF) ranks traffic sources for online video. Google, Facebook, and Yahoo! are the top three — in that order. Not surprisingly, Facebook has the highest growth rates, while Yahoo! and Twitter’s growth rates are on the decline. The study also found that websites for print newspapers topped online-only media in a variety of stats, including the total number of videos uploaded. Newspapers came on second to broadcasters for total minutes of streaming video uploaded — 1.4billion and 1.7 billion, respectively. Magazines were third with 1.3 billion, and online-only media didn’t even reach 400 million minutes. 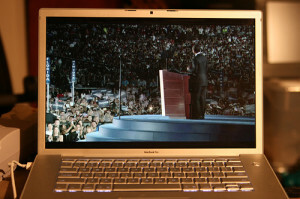 Overall, there was a 147% growth in video uploads from all media types in the fourth quarter of 2010 compared to Q3. Image by <a title=””Obama’s speech” on Flickr” href=”http://www.flickr.com/photos/quinnanya/2807768938/” target=”_blank”>Quinn Dombrowski/quinn.anya, used under its Creative Commons license.